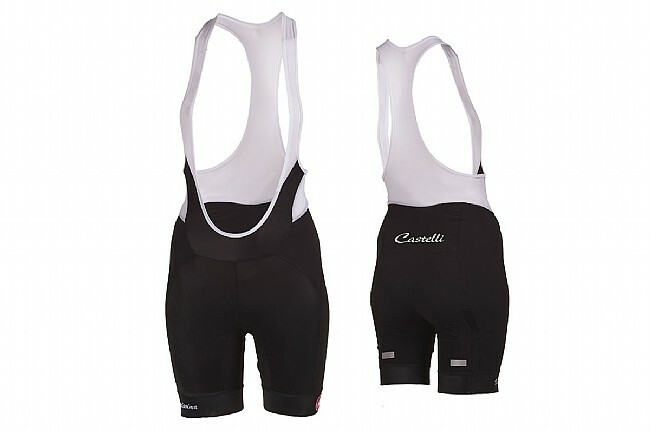 Castelli's Women's Velocissima Bib Short is sure to give you an unfair advantage that sets you apart from the pack fodder. It's packed with cues from Castelli's Rosso Corsa line, featuring Giro3 leg grippers that are thin and lie completely flat and an Endurance Evolution construction that gives the just the right amount of compression while providing superior moisture-wicking for a drier and higher-performance feel in all conditions. An elastic-free waist eliminates irritating stitching, and redesigned bib straps feel right at home on any body shape. The Velocissima uses an updated women's-specific Kiss Air Donna seat pad with a seamless top and dual density foam padding for optimum comfort. Reflective accents at cuffs. Claimed weight is 158 g (size small).